A Very Good Time to be a 'Scaper! To all those who have aided and abetted my Kha obsession (especially my SoV mentor @BiggaBullfrog), on this site and among the Gang of Four, a big thank you for your patience. Kha appears to be on track to be released as an SoV unit (although it may be posthumous ). To @Dignan and @Flash_19, thanks for their fine maps. I've been suggesting Dignan's maps in my blog for years (see Kolakoski's Map Suggestions), while Flash_19's are relatively new on the scene. To dok, thanks for Flip 'em first, which I recommend to anyone who "hates glyphs." To the above mentioned New York City Gang of Four (@chas, @Sherm an, and @Taeblewalker), who keep "Scape alive for us locally, a biiiiig thank you. And thanks to the Community at large, for everything you do, big and small, noticed or unnoticed, to keep Heroscape a "living" (as opposed to dead) game. A full month of 'Scape (by my standards) begins on July 11th, with a day of [I]Sherman/]scape. First up, his Batcave scenario, featuring good and evil teams of his Supers, followed by a team kill em all draft game from all his customs plus Classic and VC. 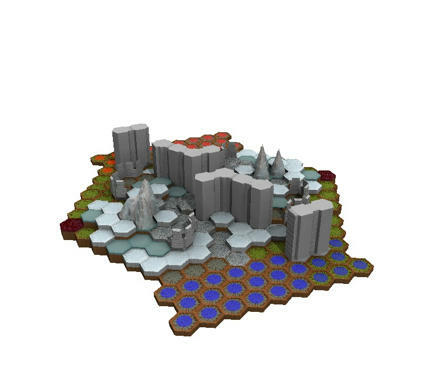 Then, on July 22nd, it's Islandscape, with its 5 army format (500, 525, 550, 575, and 600 points). In both the second game of Shermanscape and the 550 point Islandscape army, Elaria the Pale appears. She has been my favorite figure since her release, and piqued my interest in the Pathfinder line of miniatures, from which I selected the miniature for Kha (and he has much in common with her). Well, she is Tricky! I'll surely find out how "tricky to use" she is at Islandscape, where she will run with a Roman army featuring Ne-Gok-Sa. This Ranking was given to her even before the appearance of the Nottingham Brigand. The Rogue faction, while not super powerful, contains a cool mix of units, including Darrak Ambersand, Cormin the Dark, and the newest Rogue, Locksley (not to mention, down the road, Kha). All in all, a very good time to be a 'Scaper!